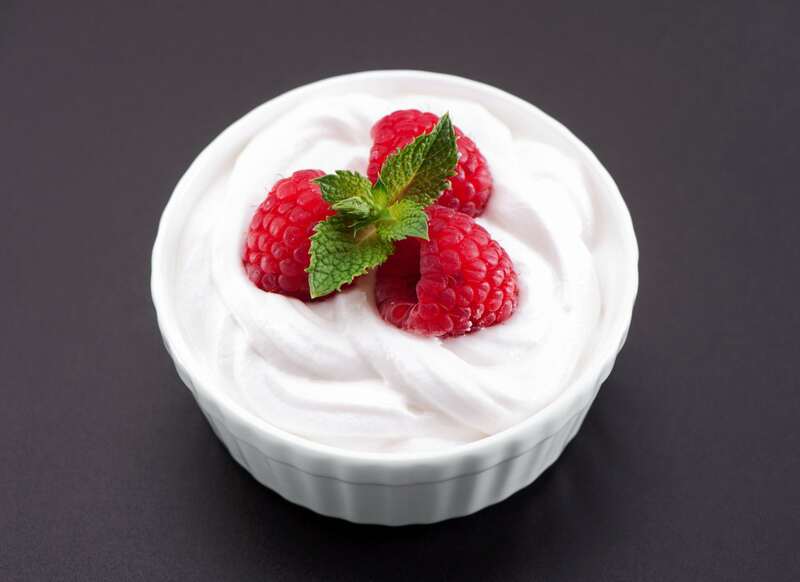 Coconut kefir is a decadently delicious dairy-free whipped cream like pre and probiotic food, that supports a healthy microbiome; the beneficial bacterial diversity in the colon. It tastes great and goes well with fruit, organic fruit preserves, and on many desserts, and is great in smoothies. Like whipped cream, it has a light creamy flavor but is mildly tart depending upon how long it has been fermented. Coconut kefir is made from canned whole coconut milk and thriving Kefir grains. It contains medium chain triglycerides which burn fat into energy and guar gum which is a healthy prebiotic. Prebiotics help healthy probiotics live and thrive in the intestines. We are learning that getting probiotics from the foods we eat, can be superior to taking probiotic supplements. Diet based probiotics more effectively activate the immune system of the large intestine to use the probiotic bacteria. The goal is to get a wide variety of beneficial probiotic bacteria in our diet, to foster a healthy microbiome. A healthy microbiome forms a basis for an inflammation-free body. Coconut Kefir prevents, allergies, chronic degenerative diseases and supports a healthy balance in mind and emotions. Coconut kefir is rarely, if ever, found in stores. Knowing how to make it is a learning curve. Once you know it’s quite easy. First you need to be having Kefir grains that are flourishing and multiplying in regular full fat pasteurized bgh-free, (bovine growth hormone-free), dairy milk for about 6 days. Once that has been achieved you switch to making Kefir with Coconut milk. Then it takes about 24 hours to make Coconut kefir and you can make about 4 batches of Coconut kefir before you need to feed the Kefir grains by making Kefir using dairy milk. Kefir grains feed on the dairy milk; so they periodically need to be ‘fed’ with dairy milk. To get started you need to get Kefir grains, I recommend from Thomas Egbert, at Fusion Teas. For under $20 you can purchase kefir grains along with full instructions, videos and personalized support for making the dairy milk kefir. That is your first step. 2 clear glass wide mouth ball canning jars, one in 24 ounce and the other in 60 ounce size. BPA free plastic lids are recommended for use in storing the Kefir in the fridge. A silicon slightly spoon shaped spatula measuring at least 11 inches long. It is recommended that you make at least your first 3 to 4 batches of dairy milk kefir using the smaller 24 ounce ball jar. Once the kefir grains are thriving making Kefir in shorter time frames, then you switch to making Kefir with the larger jar adding larger amounts of dairy milk. Once the Kefir grains are thriving making the larger jar of dairy milk into dairy kefir , (about 2 batches) then you switch to using Coconut milk. Use only canned coconut milk. Full fat coconut milk is recommended. The can needs to have a BPA, Bisphenol A free lining. Sprouts brand has the best price on the market. BPA, which is still used to line some cans and is in some plastic water bottles, has been proven to be an endocrine hormone disruptor and is not healthy. If you’d like to have a really thick consistency add an ounce or 2 of coconut cream per quart of canned coconut milk and blend briefly in a blender. Then you follow the same instructions and process you learned for making the Kefir with dairy milk, but now with coconut milk. Bear in mind that you won’t know how thick your coconut kefir is until it is made and refrigerated. It turns alot thicker when refrigerated. With a little skill, we can learn to create healthy superfoods, like Coconut Kefir, that are satisfying and taste great.